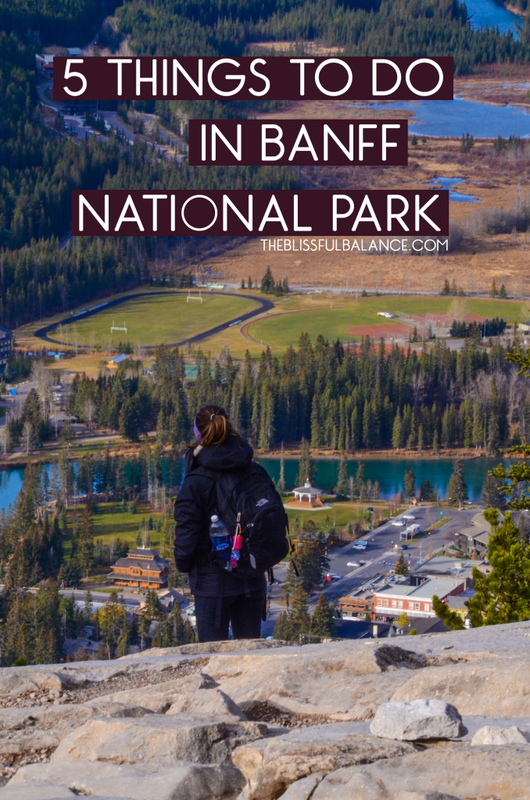 If you’ve ever been to Banff National Park in Alberta, Canada, you understand that it’s very difficult to narrow the list of “things to see” down to five. 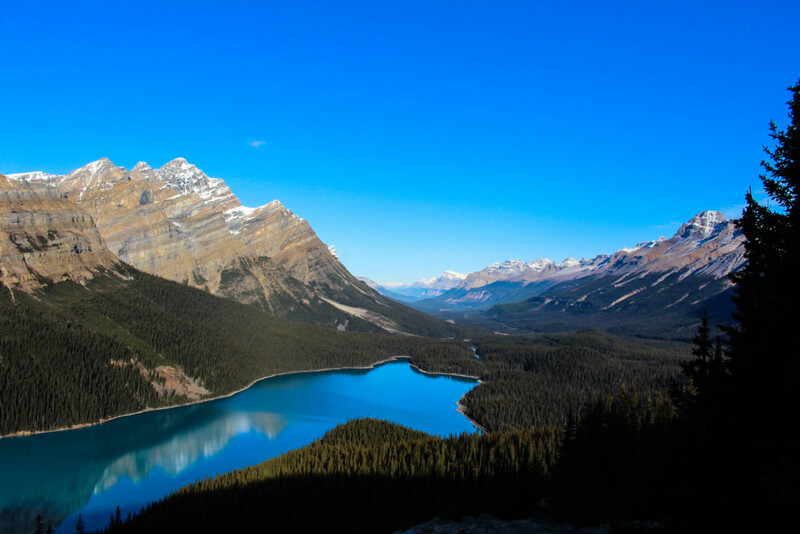 Banff is overflowing with beauty left and right, and I can guarantee that you won’t believe your eyes. 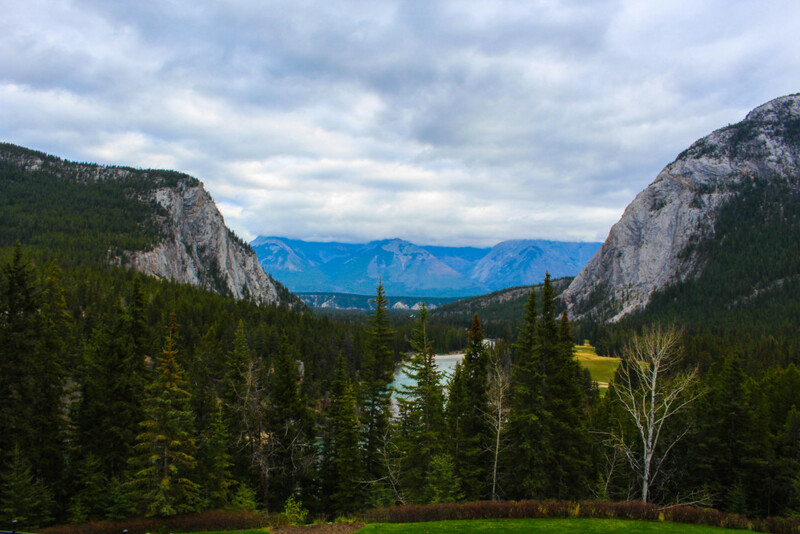 I was in Banff for about five days, filling each day to the brim with fantasy-like scenery and experiences. I’ve confined my list to five, must-see places. 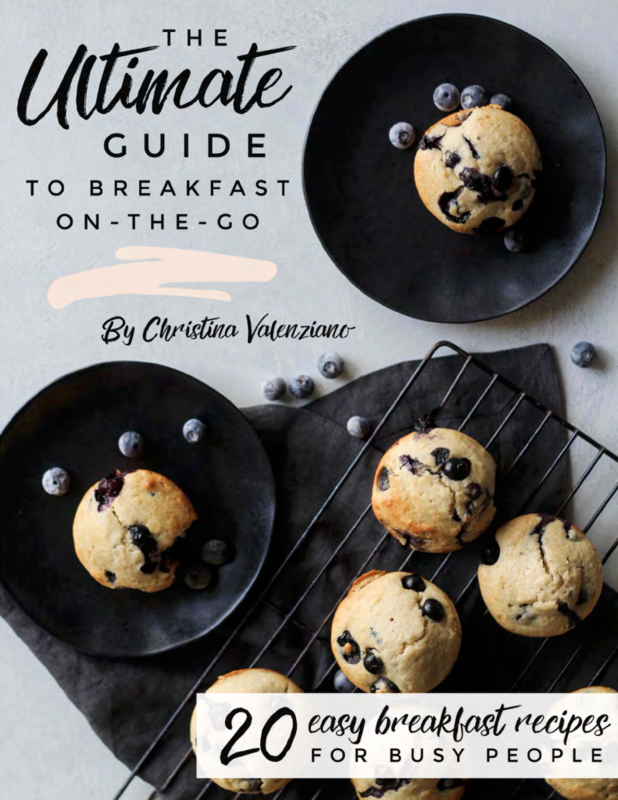 You won’t want to skip out on these. For weather reference, I was visiting in mid-October. The temperatures (Fahrenheit) during the day ranged between 30-40 degrees, and were in the twenties at night. Per common knowledge, the higher we trekked, the colder it got. Each day I wore a tank top, long sleeve shirt, vest, jacket, yoga pants (a desperate, last-minute addition for someone, like me, who doesn’t own hiking pants), and brought gloves and a beanie. 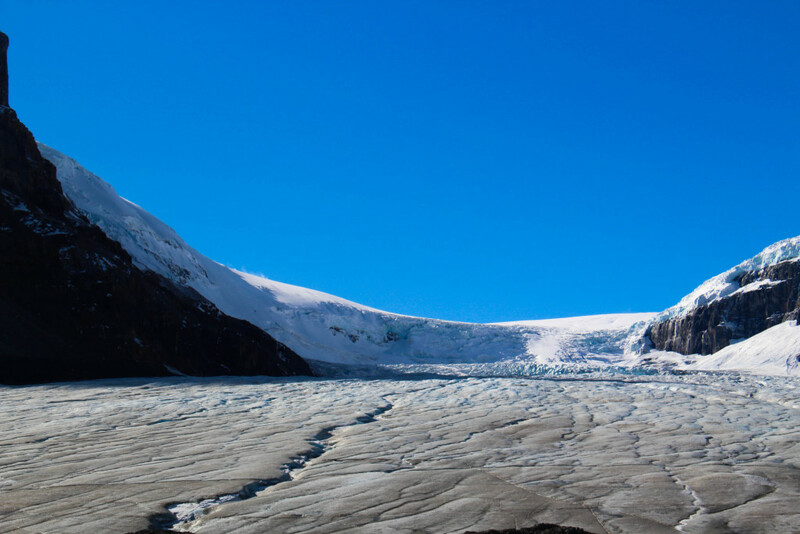 I’ve combined these two because the road to the Athabasca Glacier is an experience in itself. 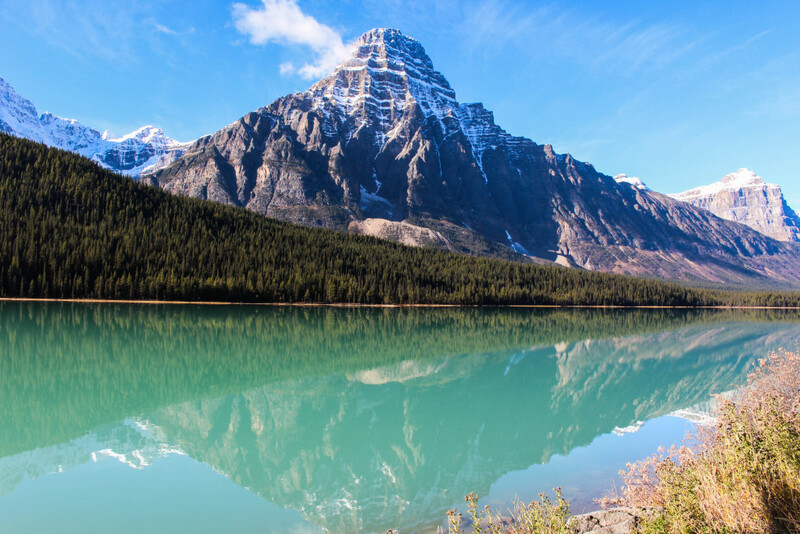 Icefields Parkway (highway 93 North) has been labeled one of the most beautiful drives in the world, and I can attest to that classification. 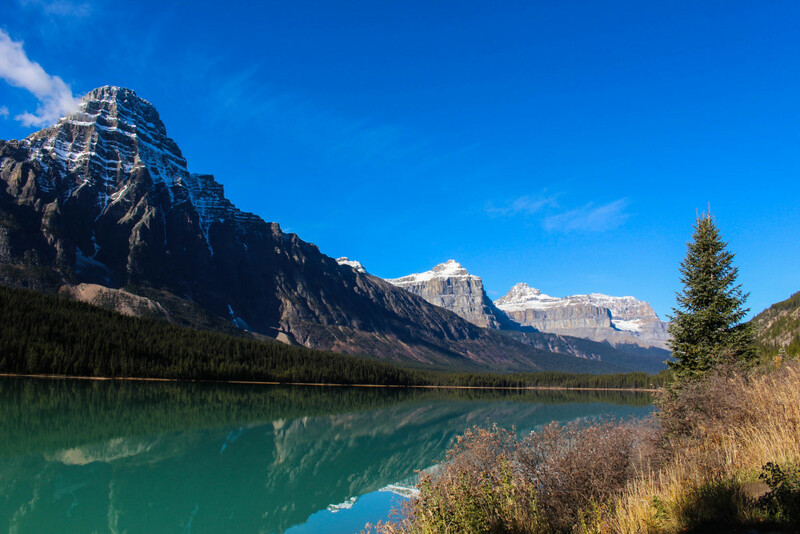 Taking you through Banff National Park and Jasper National Park, the drive to the Athabasca Glacier is about 3.5 hours. A long drive, but completely and utterly worth it. 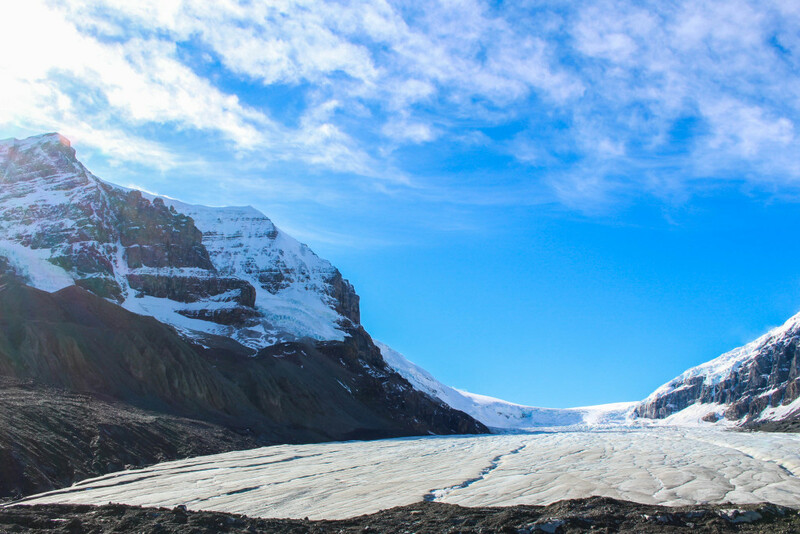 The Columbia Icefield is the largest icefield in the Canadian Rockies, overflowing into six glaciers. 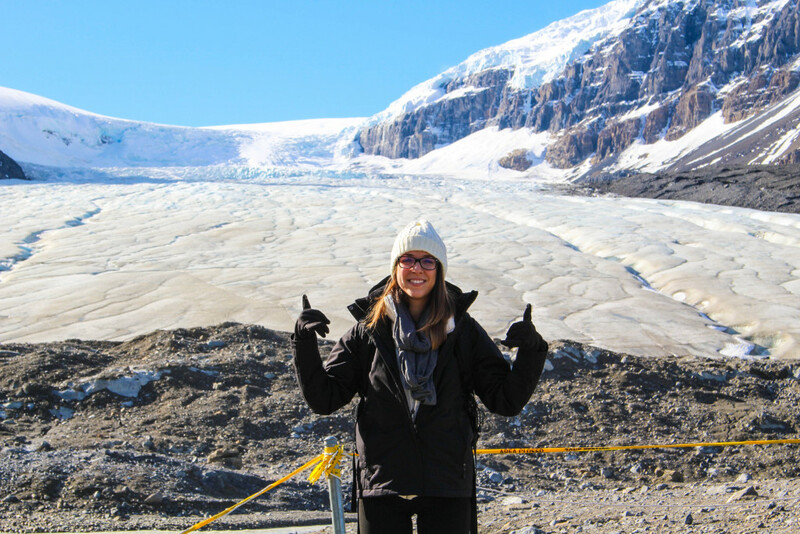 One of the six is the Athabasca Glacier, pictured above. This destination is so unique and awe-inspiring because you are able to hike up the Toe of the Glacier trail (0.5 mi) and get a number of feet in front of the glacier, the only opportunity of the six. 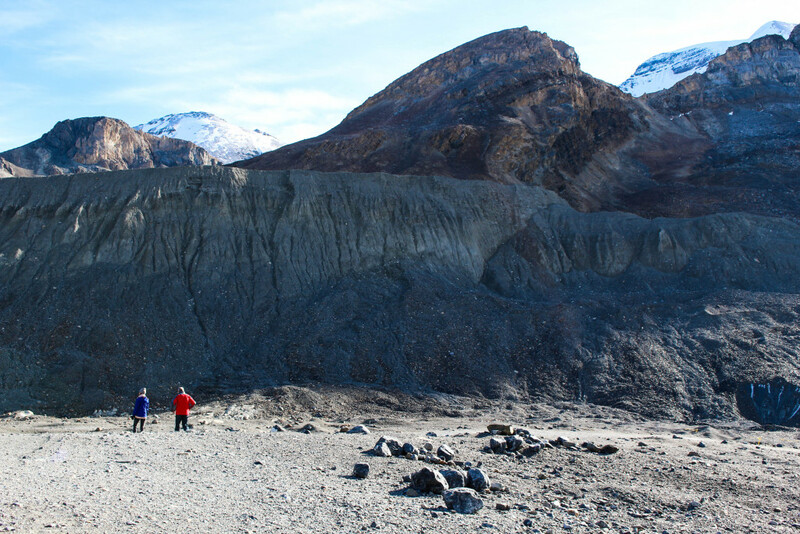 The climb up to the glacier will make you feel like you are walking on another planet; it is filled with rocks and sediment, an interesting contrast to the icey glacier that awaits you. 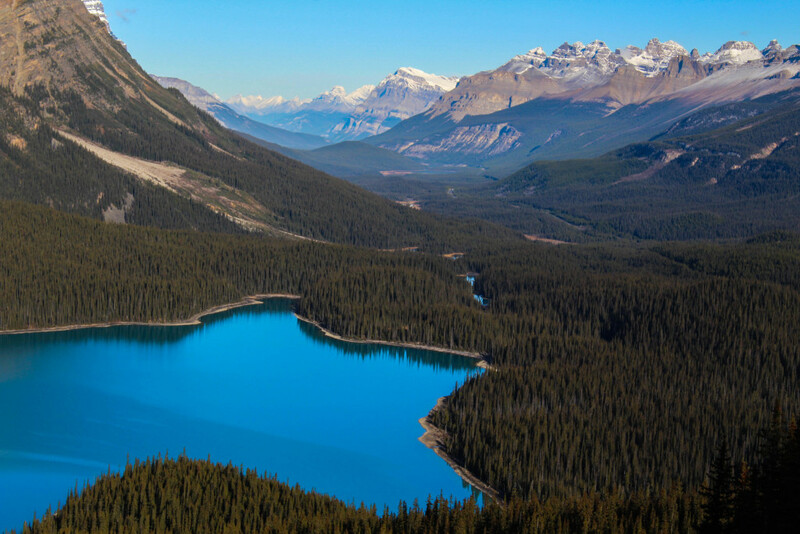 This gorgeous overlook is found when driving north on the Icefields Parkway. 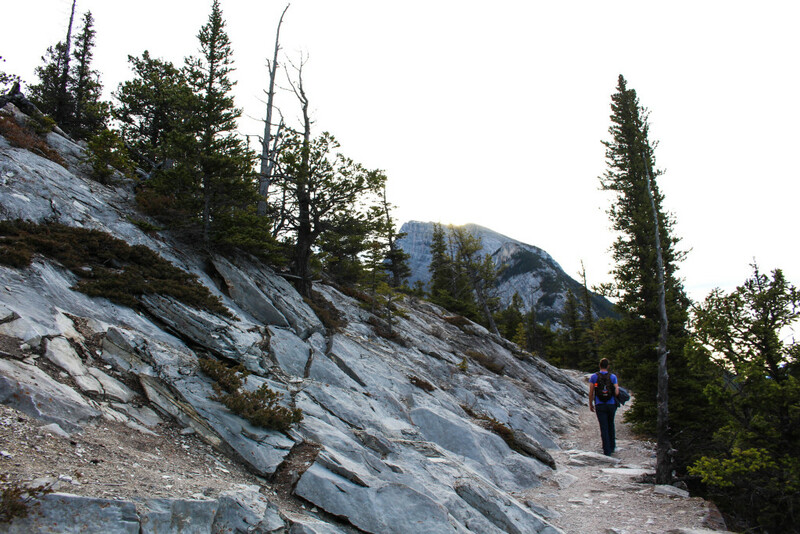 While there is an option to hike down to the lake itself, we chose the Bow Summit Trail loop (0.4 mi). It wasn’t a tough climb by any means, more of a walk up a slightly sloped trail. Throughout the entire walk, you are surrounded by evergreen trees; we joked that we felt like we were at Home Depot buying our Christmas tree. Once you reach the overlook, your breath is taken away. There is a wooden deck for photo ops and benches to relax and take in the view. You really will not believe the colors. 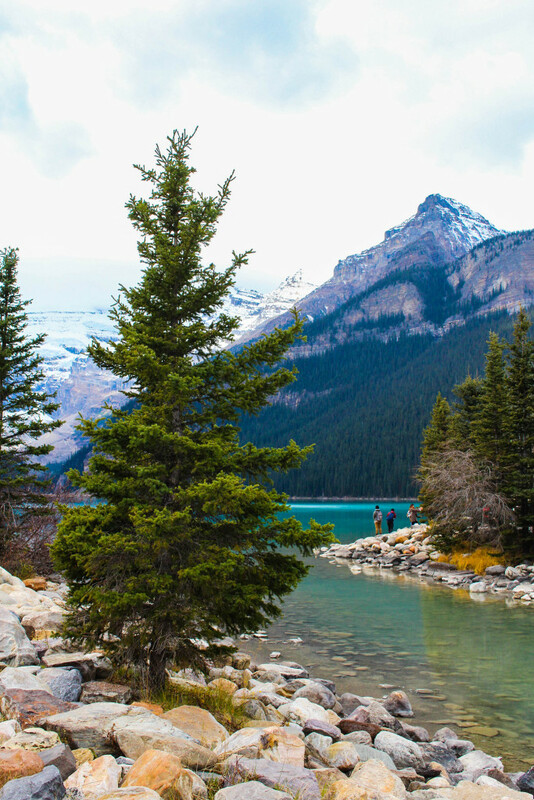 Lake Louise was, by far, my favorite spot. 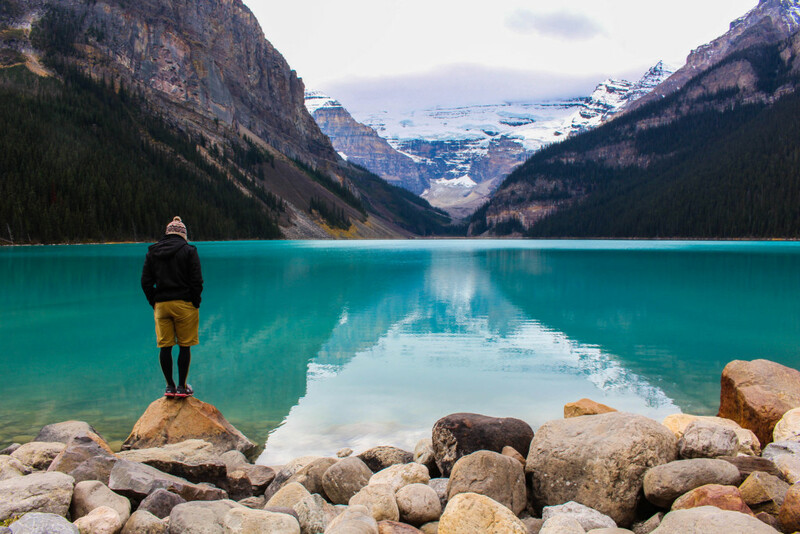 Lake Louise is considered the hiking capital of the Canadian Rockies. We opted out of the 3-hour trail and chose the Louise Creek Trail (~45 min). 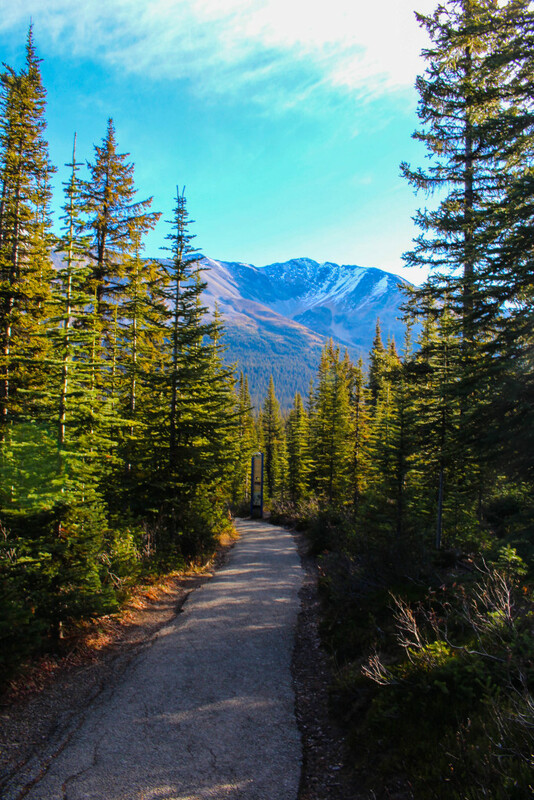 The trail is a dirt path that runs along and around the lake. 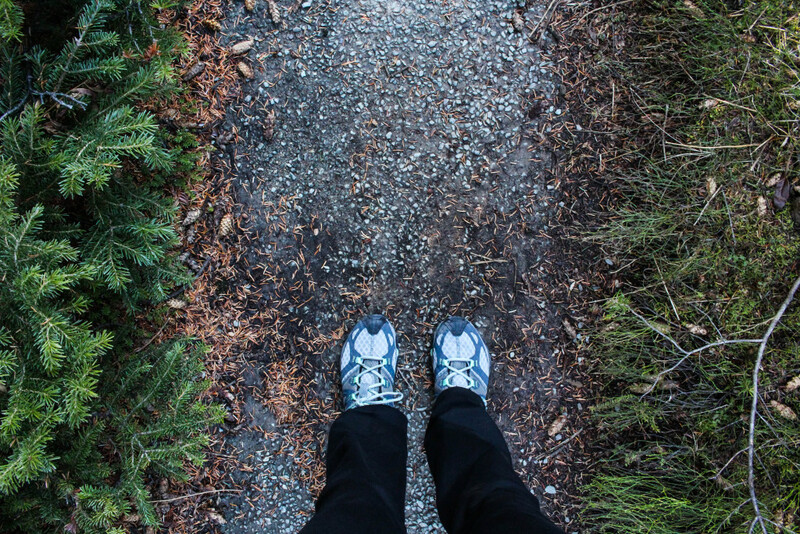 Not a difficult walk at all – take your time and enjoy the beauty. 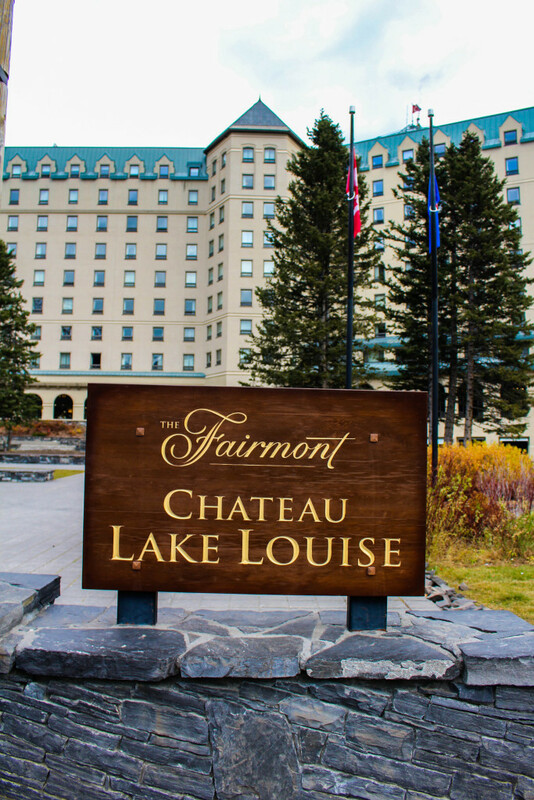 You’ll have a fabulous view of the Fairmont Chataeu Lake Louise. This was not where we stayed, however can you imagine waking up to that view every morning? Unreal. And yes, that is what the water looks like. 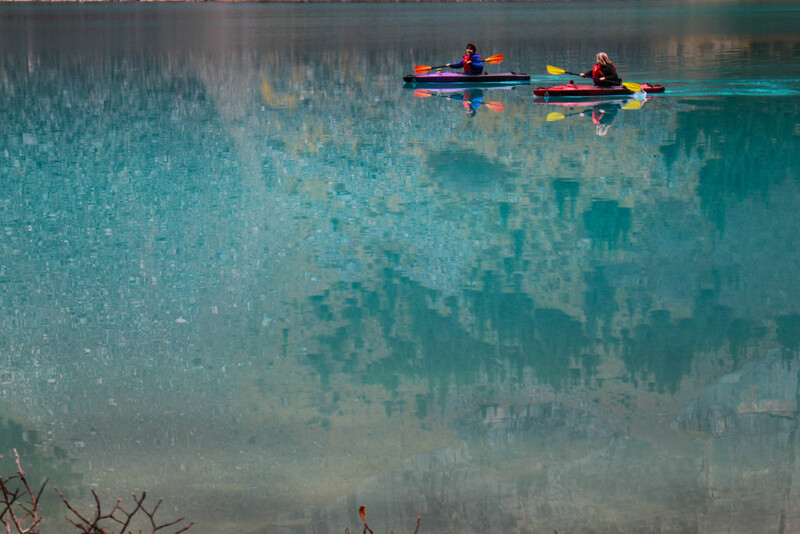 The water at this lake in Canada is UNREAL. 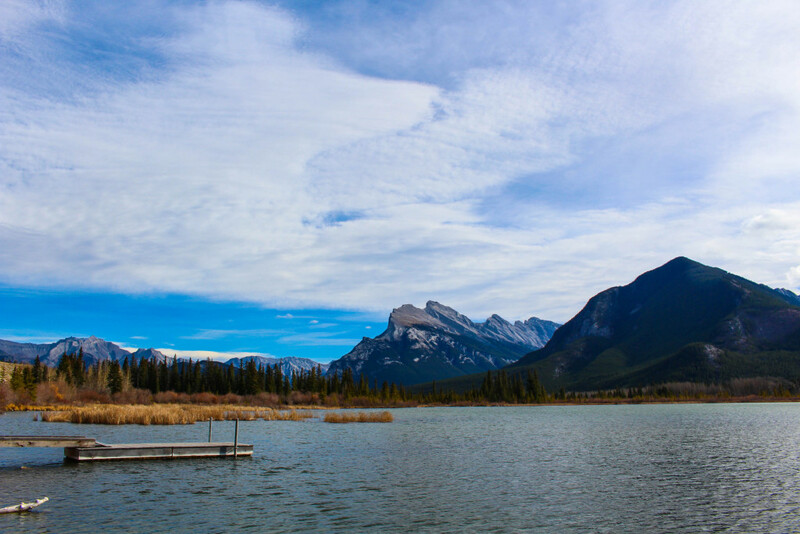 Tunnel Mountain is a mountain situated in the Bow River Valley in Banff. 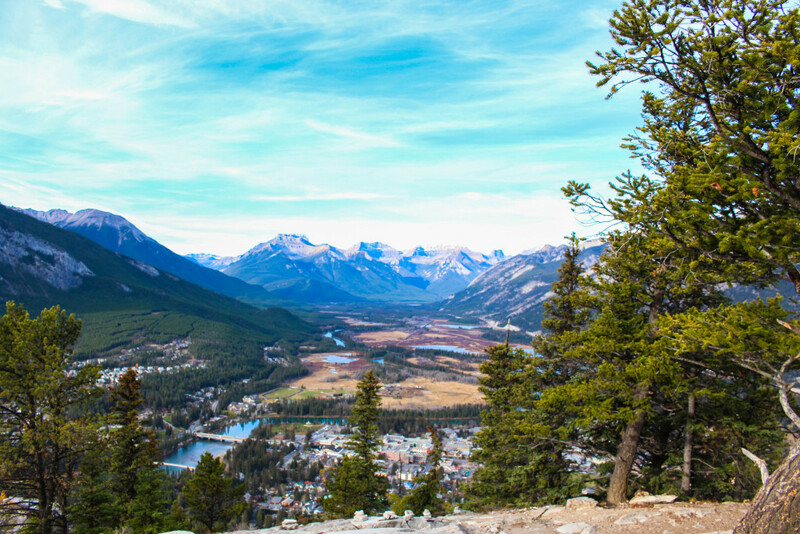 It’s a great hike because it isn’t too difficult and it gives you a fantastic view of the town of Banff and the valley; it is three miles round-trip. As you can see, as expected, during the hike our bodies were getting a bit hot, so layers started to come off. However, once we reached the top, the temperatures dropped and we were back to being cold. 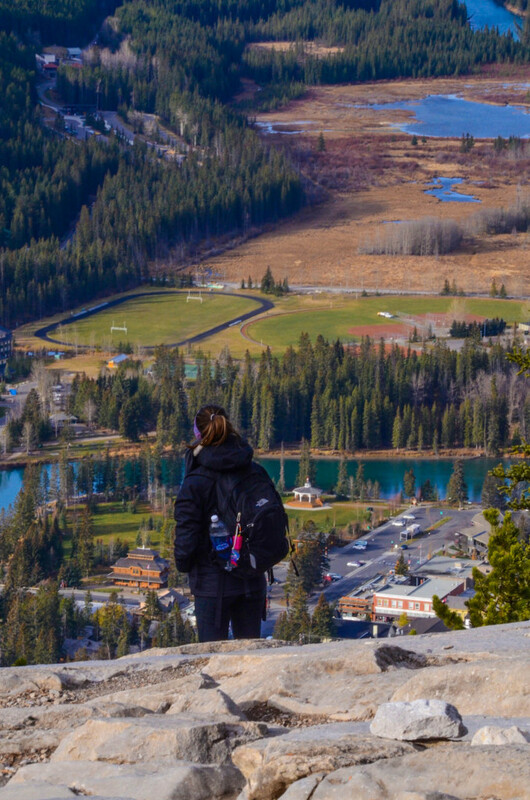 If you want to stop and enjoy the view without rushing back down to get back to not being freezing, bring your layers! 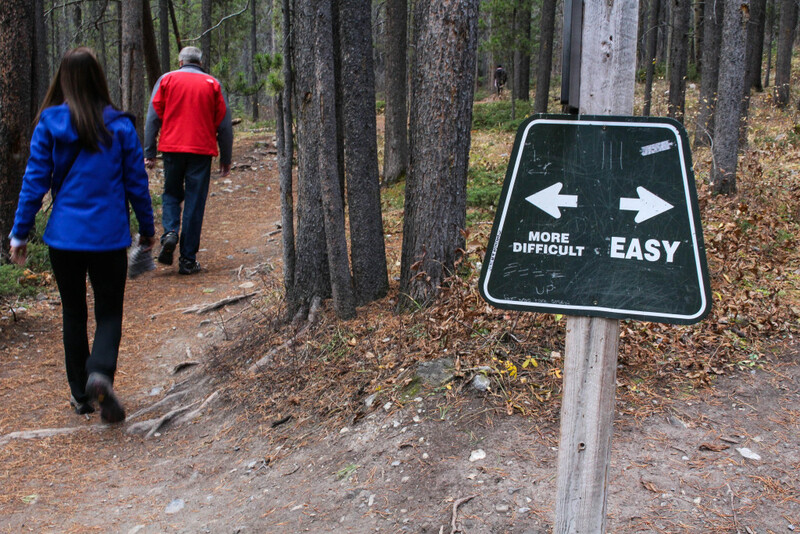 At the Grassi Lakes Trail, there are two hiking options: the easy trail, and the more difficult trail. I highly suggest, if you and your partners are able to, take the more difficult trail. We had no clue what we were getting ourselves into, but it was definitely the right decision. It had rained prior to our arrival, so unfortunately the trail was a bit slippery, which resulted in it definitely being true to its’ title. It consisted of a lot of rocks, very steep climbing and creeks meandering through. 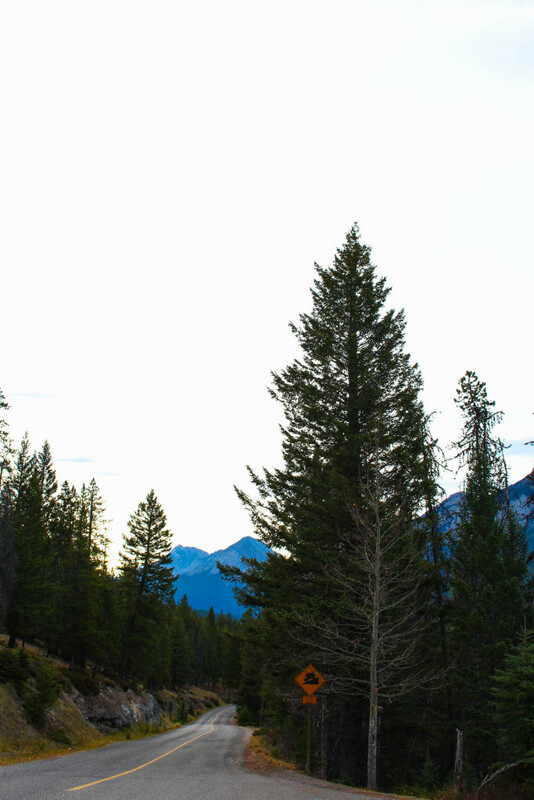 We took the easy trail back down to our car, which proved to us that the more difficult route is the best for scenery. We stopped our hike at this pond, which was surrounded by benches, had an outhouse (which was closed during our hike, much to our chagrin) and was filled with clear, fresh, freezing water. Gorgeous. Worth the difficult trail, I’d say. 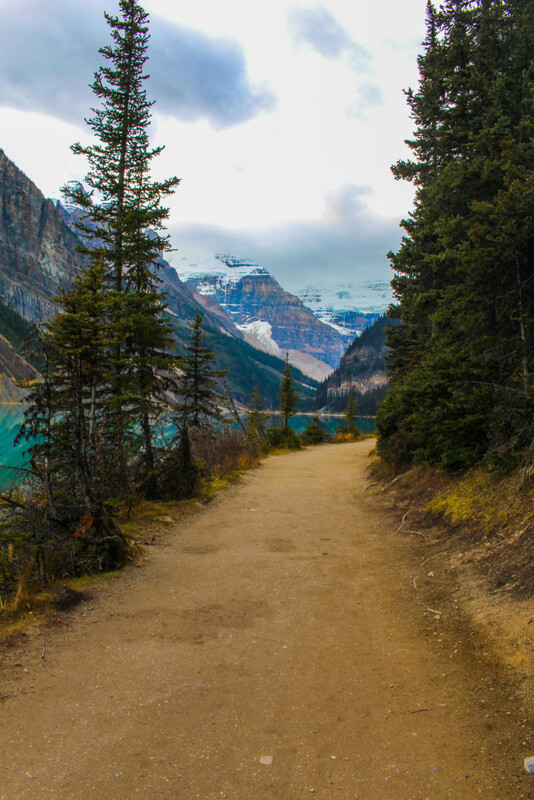 The day we took on the Icefields Parkway up to the Athabasca Glacier, we stopped at Safeway early that morning to buy food for lunch, knowing that the car ride was going to be a long one. We each bought a sandwich (well, Christian decided on pulled chicken, pita and hummus #fancy) to take along. 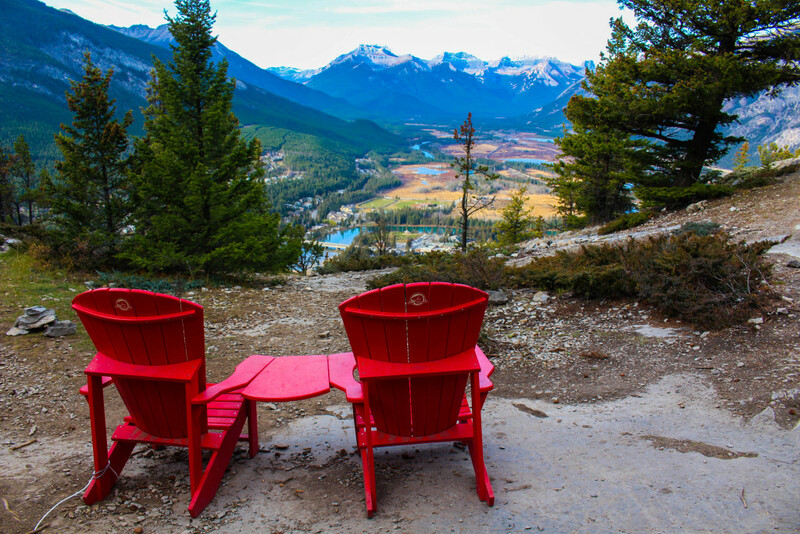 Although we had it in our minds that we wanted to stop on the way back at one of the many overlooks with picnic tables, we decided on something else. 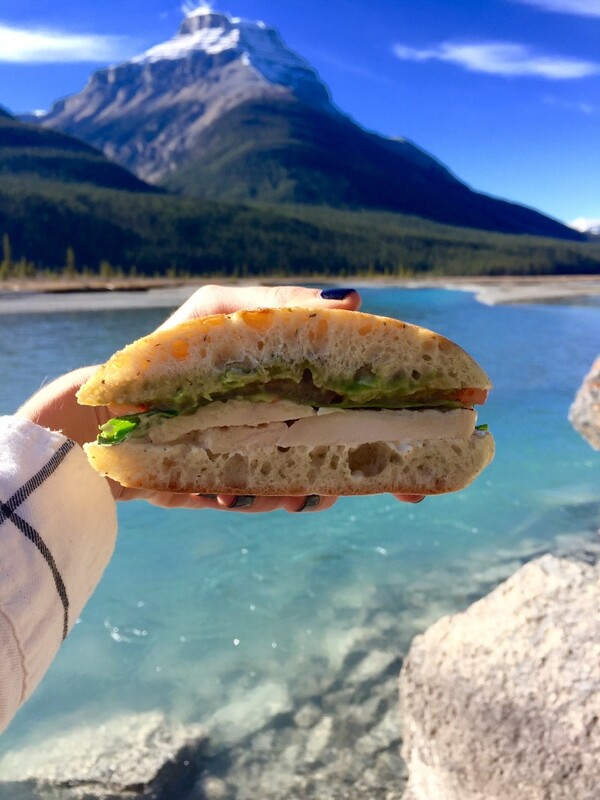 We sat on rocks right on the Saskatchewan River and enjoyed our sandwiches looking at beautiful mountains and flowing, clear blue water. It was unlike anything I’ve ever experienced; the most tranquil picnic you can imagine. 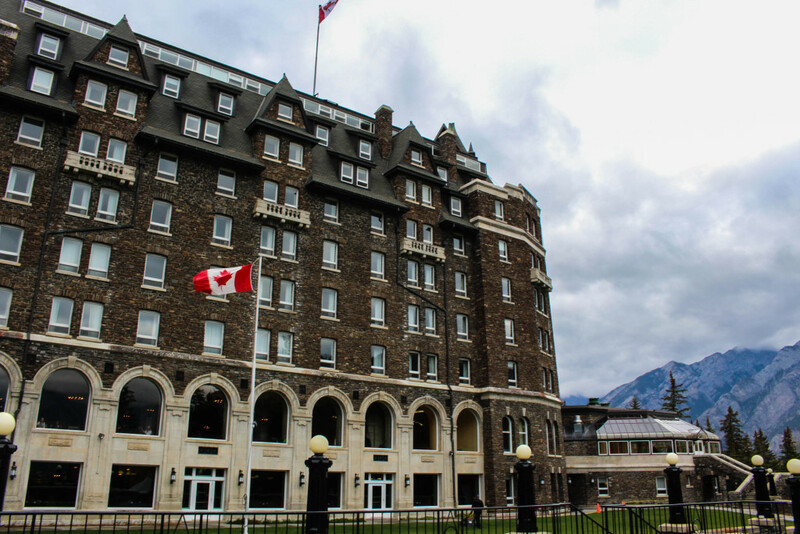 Go see (and walk around in) the Banff Springs Hotel. It’s ridiculously gorgeous, elaborate and makes you feel like you’re in a castle. View from the balcony of the hotel. 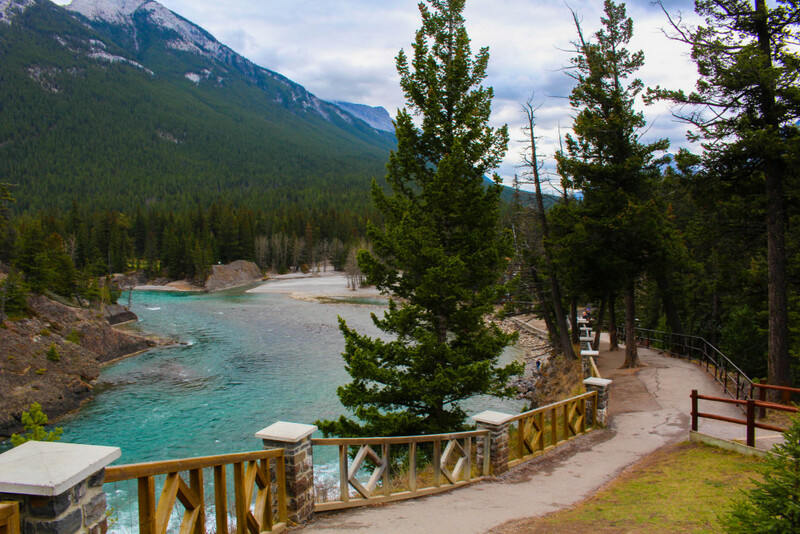 Banff Hot Springs, right by the Banff Springs Hotel. 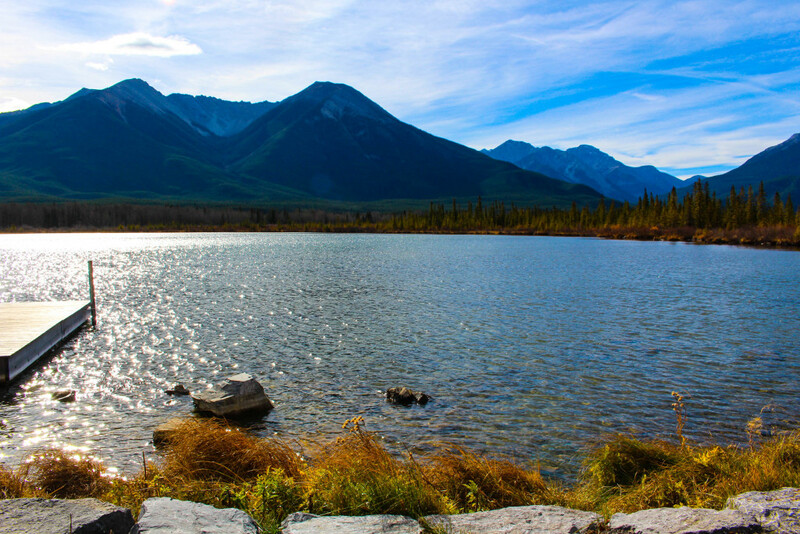 Gorgeous water – an easy walk up stairs and you’ve got a beautiful view of the springs and mountains. 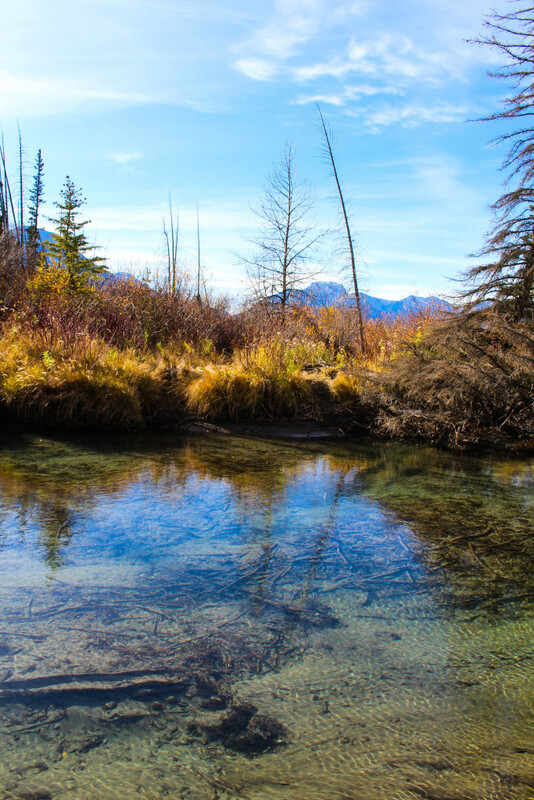 Vermillion Lakes and the Marsh Loop Trail right outside of town. 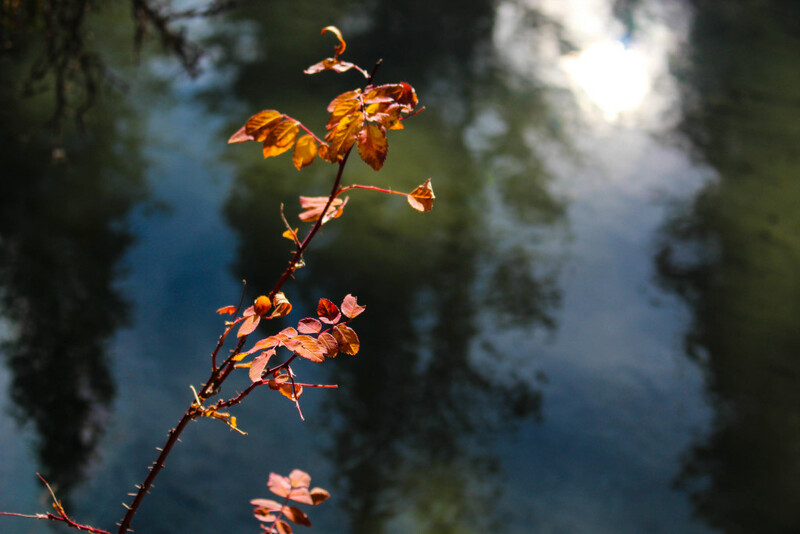 Walk the trail then drive down to the lake, sit on a bench and enjoy the sounds of nature. 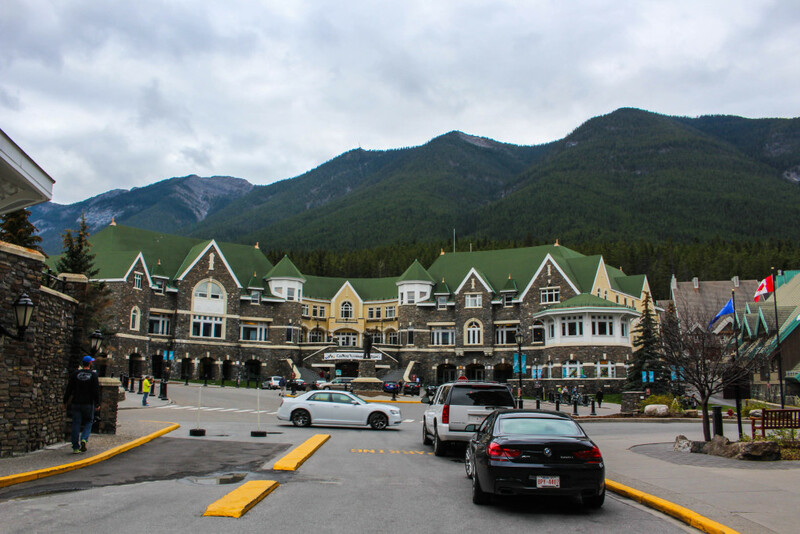 There are plenty of hotels, even hostels, in Banff Town. 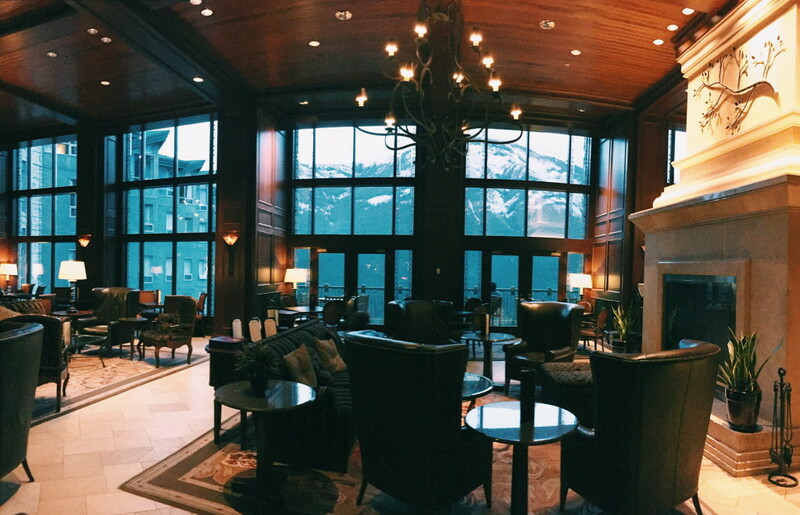 We stayed in the Rimrock Resort, a little ways from town. 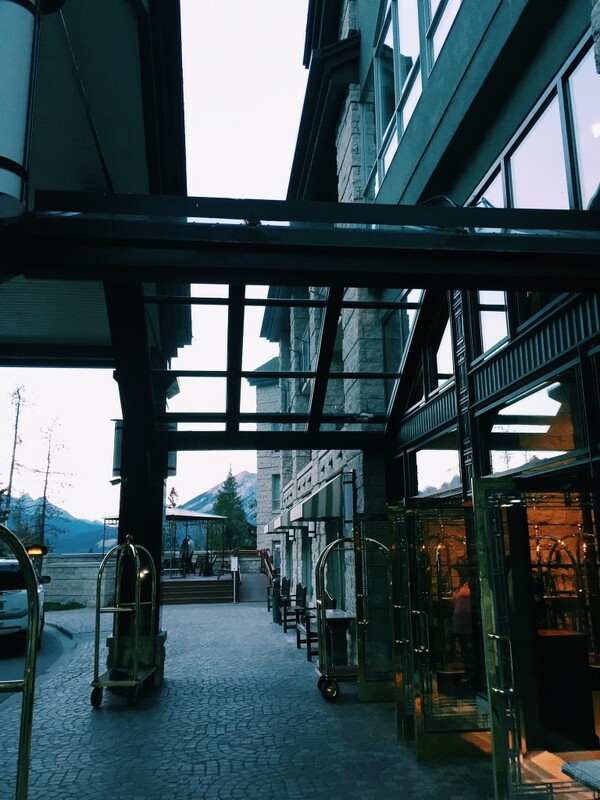 With a gorgeous view of the mountains, wonderful staff, a bus that takes you to and from town at all hours of the day/night, and a beautiful room, I would highly recommend this hotel. 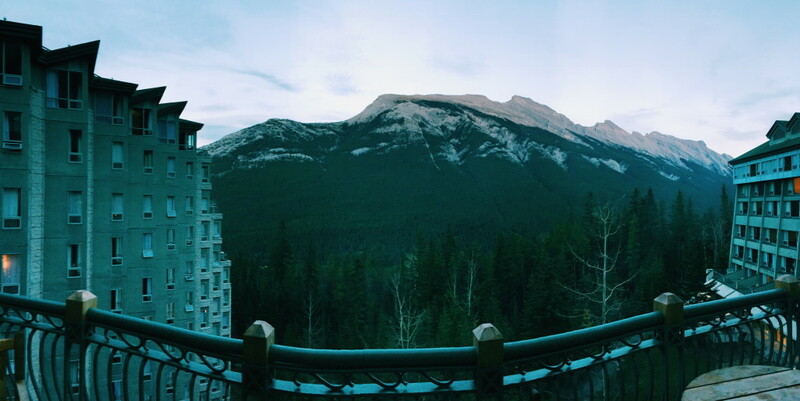 Banff was an unforgettable place; I already miss it dearly. 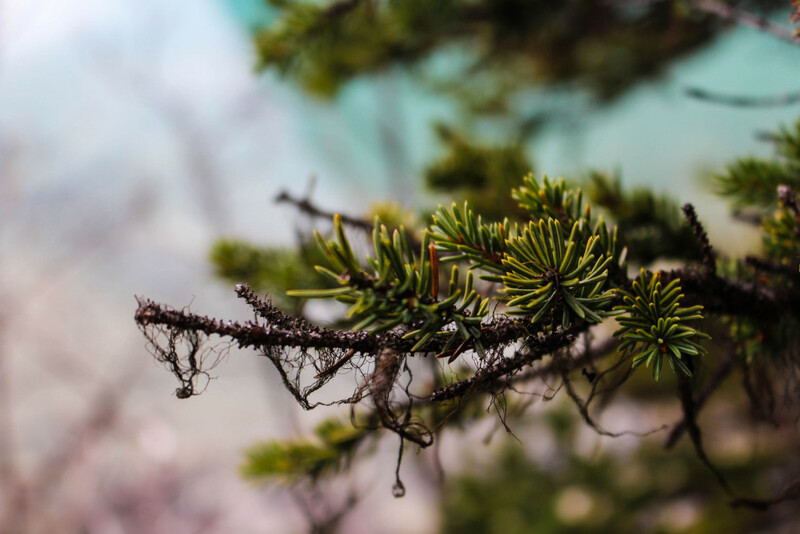 If you’re a hiker or have been hiking, what tips do you have for amateurs? What is your favorite way to stay active on vacation? 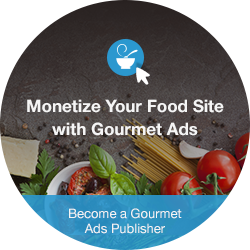 If you enjoyed this post, don’t forget to pin it to your travel board! Christian is pretty darn talented – check out this video he made highlighting footage from our trip! 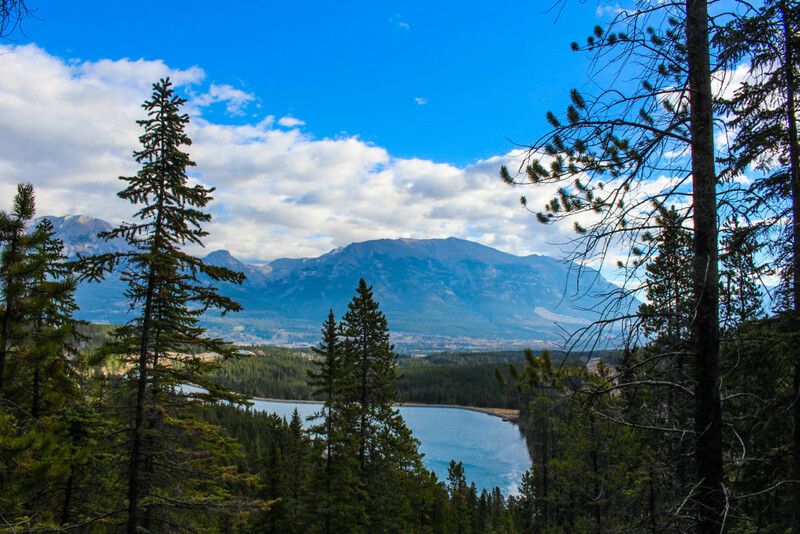 Adventures in Alberta from Christina Valenziano on Vimeo. How is this place real???? Incredible! I’m glad you enjoyed Banff and Lake Louise! I lived in both places for a few years back in the 90’s – gasp was it that long ago. 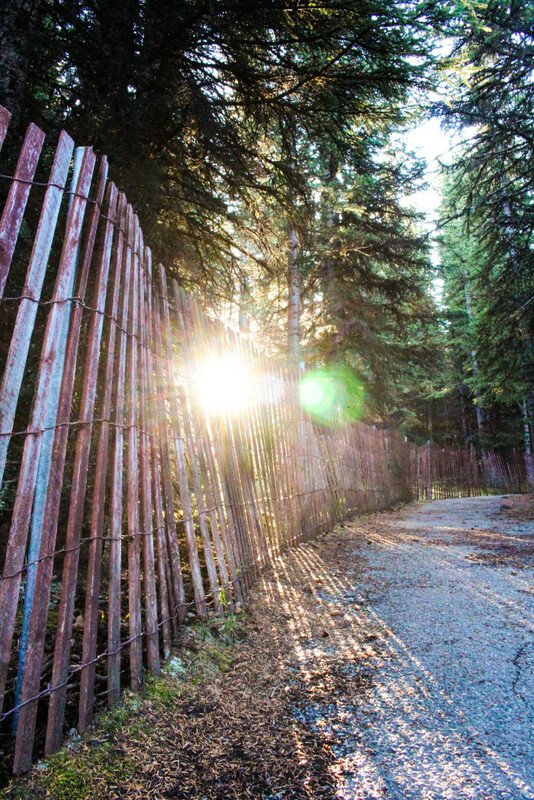 I remember climbing Tunnel Mountain numerous times to watch the sunrise. 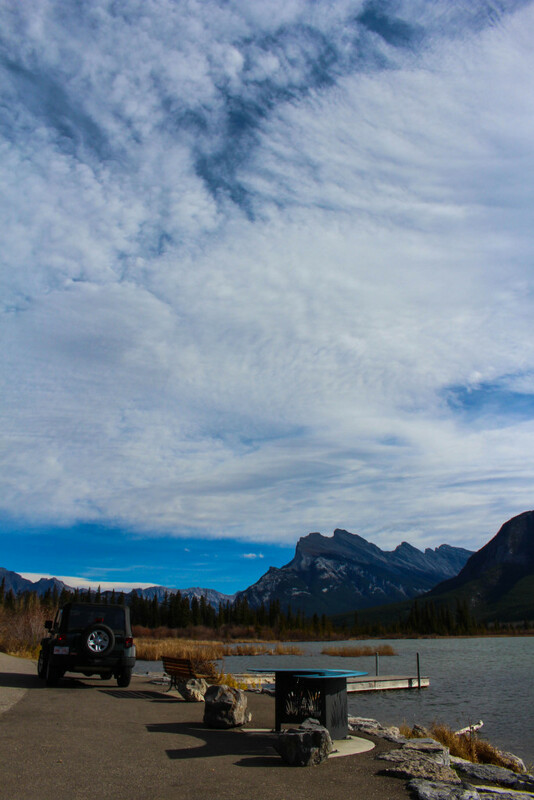 The Lake Minnewanka loop is another great drive/hike about 5 minutes out of town. 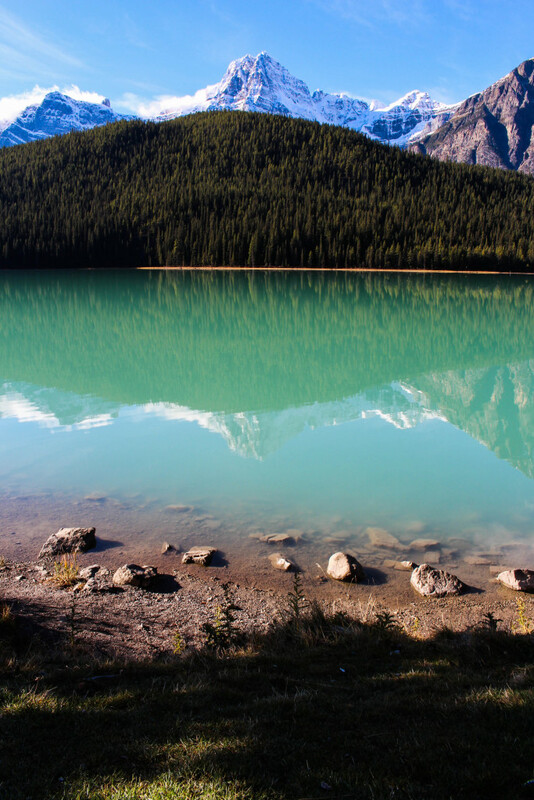 I think we did Lake Minnewanka, too! 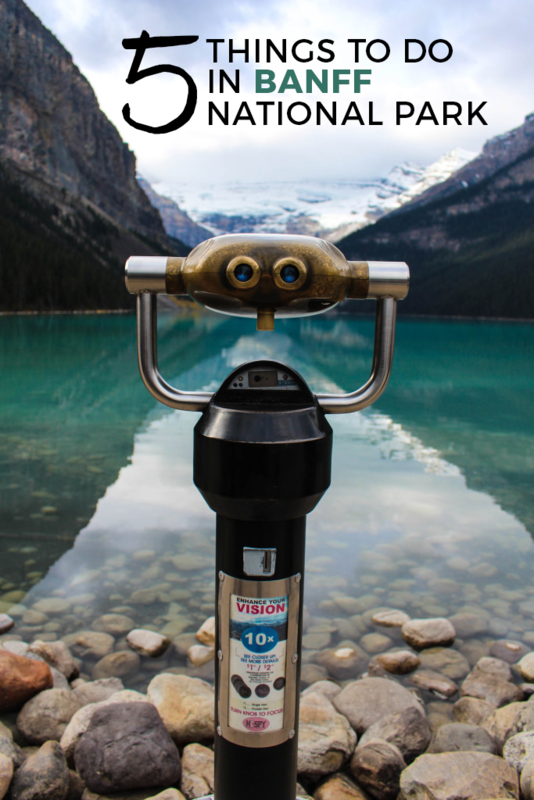 I kept getting confused – there were so many beautiful lakes and sites! ha Thanks for the love! These pictures are incredible! It doesn’t even look real. I’ve never considered traveling to that part of the world, but I’m definitely reconsidering now. Your pictures are breathtaking!! 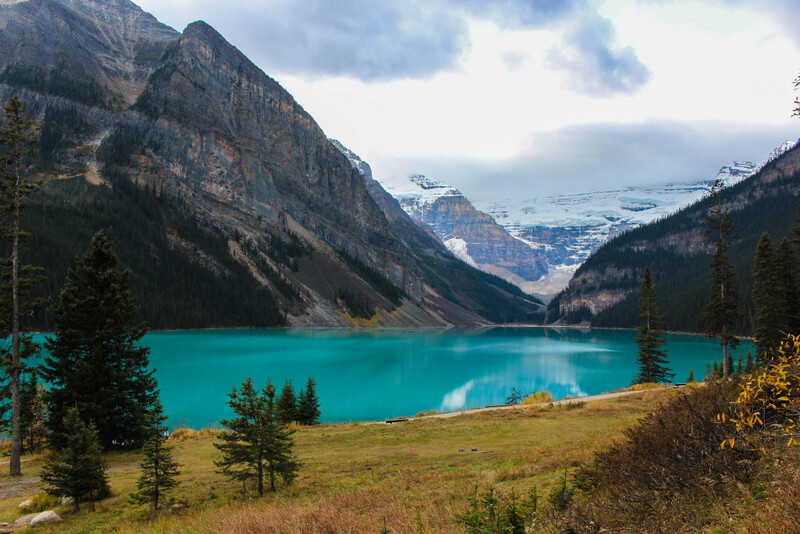 Canada has been on my bucket list for some time now. It’s beautiful! It was truly stunning – easy to take good pictures in a place like that!! thanks, Alex! Absolutely stunning! Seriously every picture looks like a postcard! breathtaking photos. 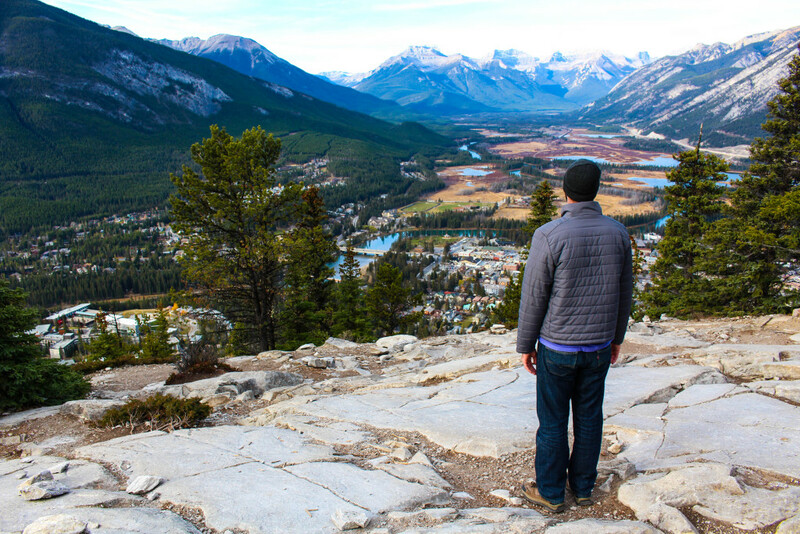 i want to go to banff! Thank you so much, Hillary! You really should!! Gosh, these photos are amazing. 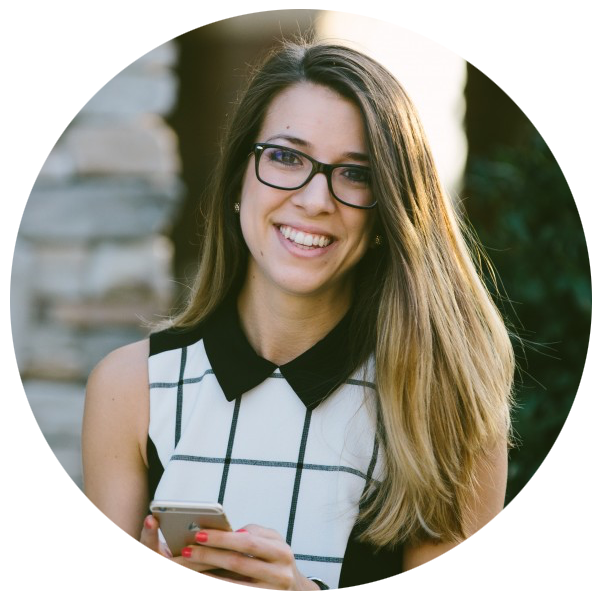 I loved following your journey while you were adventuring! Such beautiful places. 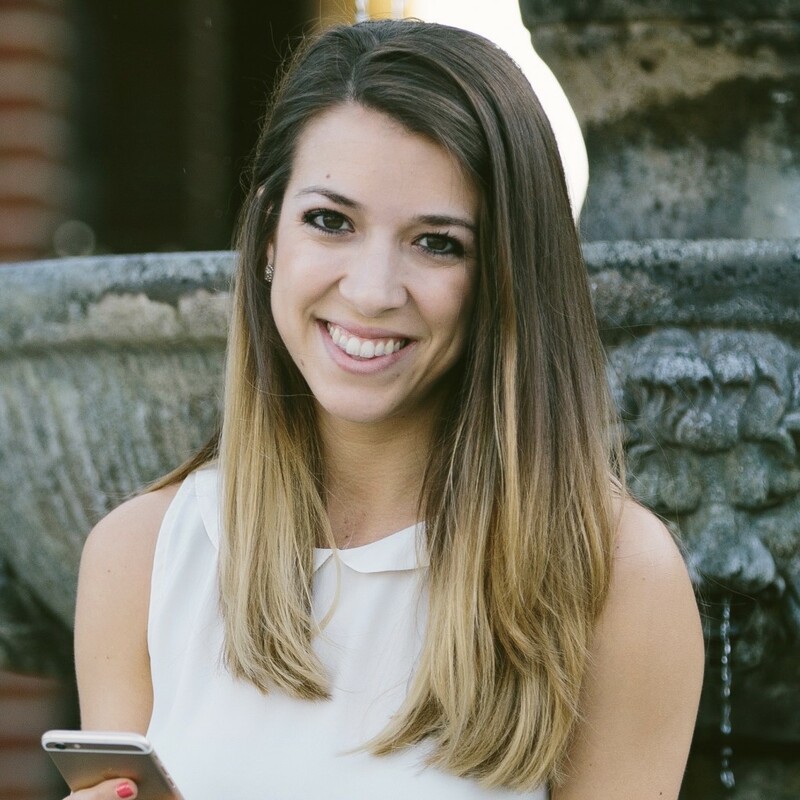 Lindsay @ A Runnaroundd Life recently posted…typical weekends. Thanks so much Lindsay!! It was truly breathtaking. 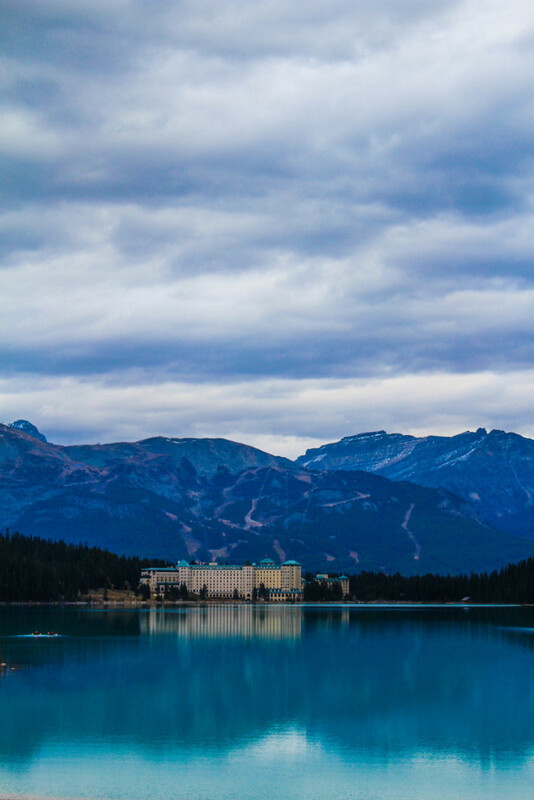 I’ve been wanting to get to Banff for years, especially Lake Louise! This has sparked that desire again. Dying to see that BLUE water! Oh Liz you have to go. It’s breathtaking. 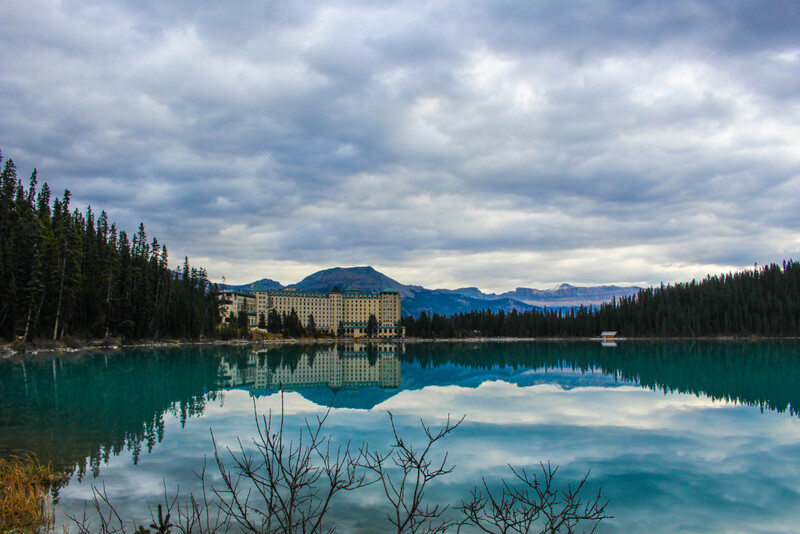 Lake Louise was unreal. Seriously I know some of these photos look very re-touched but that’s really what it looked like!! Oh my gosh, these photos are STUNNING!! 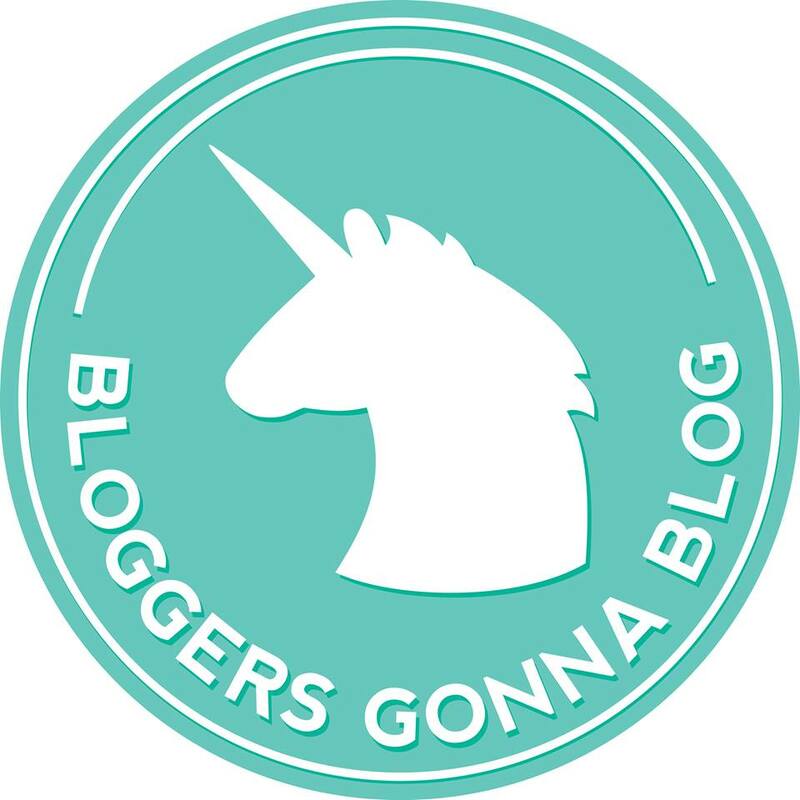 I hadn’t heard of Alberta before blogging (I know at least one or two that are from Alberta) but now it’s on my list! Out of curiosity, may I ask what lens you used for your photos? Trying to learn all I can, hehe. Thanks so much, Jess! For the entirety of this trip I used the lens that my camera came with, I have a Canon EOS Rebel SL1 with a 18-55mm lens. I only have one more lens and that’s a 50mm that I use for food shoots. Saving up for another one soon! Wow, these pictures are stunning! 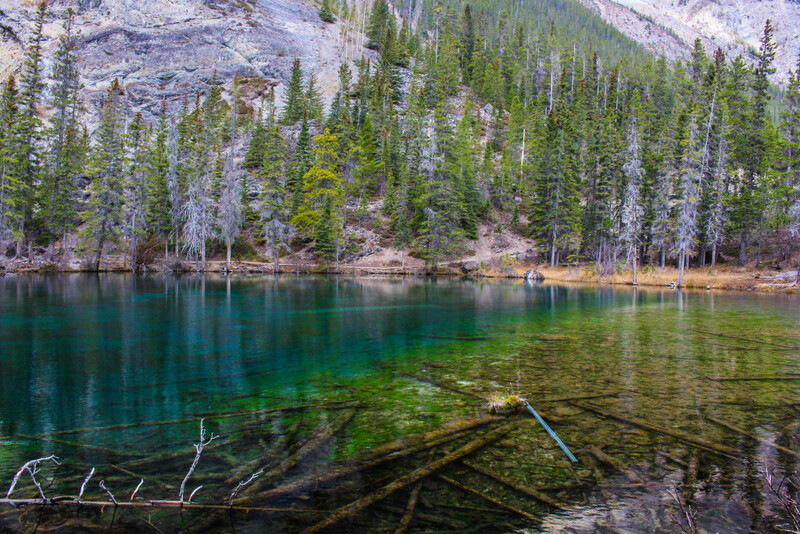 Makes me want to visit Banff ASAP!! 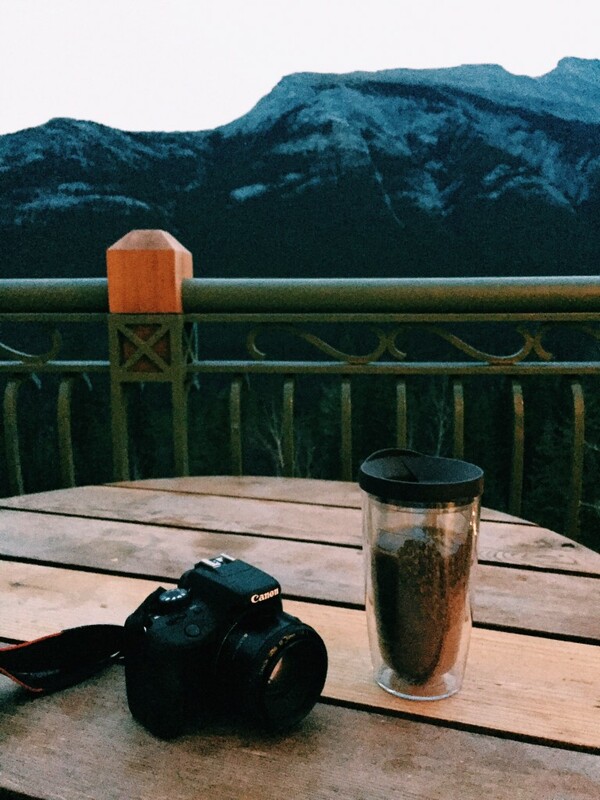 I would love to wake up to that view every morning! 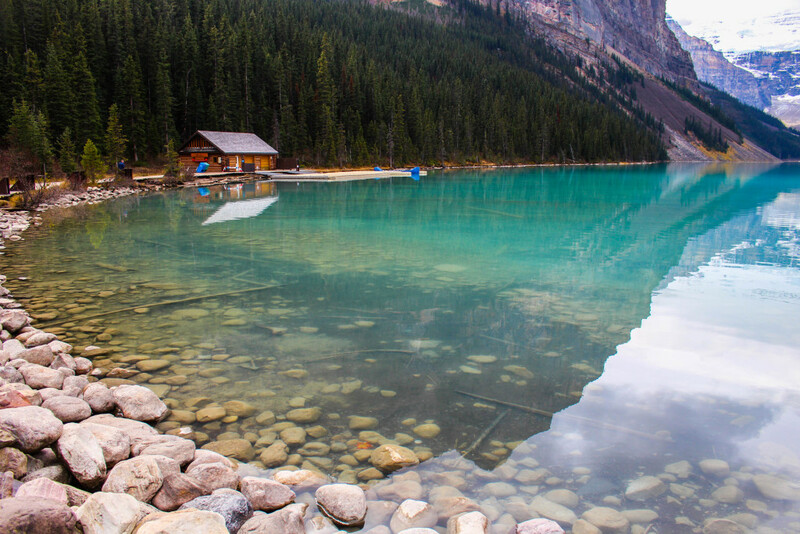 I have been dying to go to Lake Louise for years! Your pictures are gorgeous! I want to book a flight for.. This weekend? Your pictures look like freaking paintings. WTF. bahaha thanks Ashley. YA GOTTA. THis is INCREDIBLE. The heavens declare the glory of God. AWESOME! 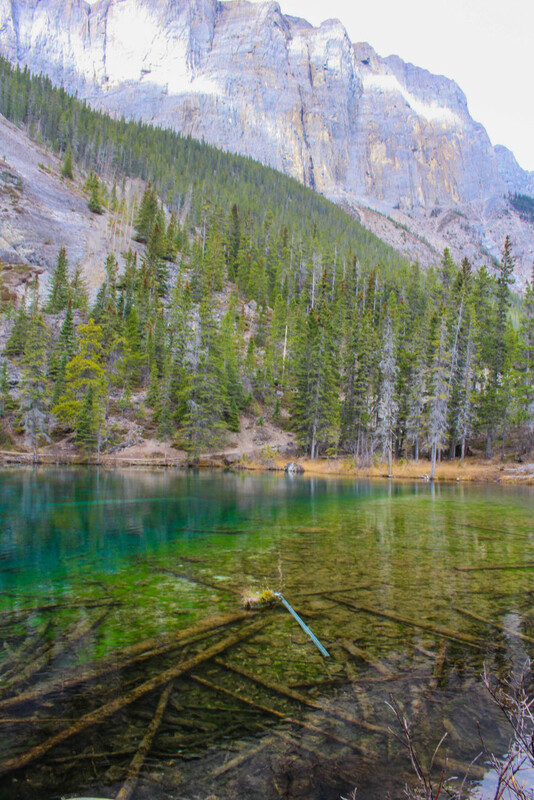 Banff is a magical spot no matter the season! 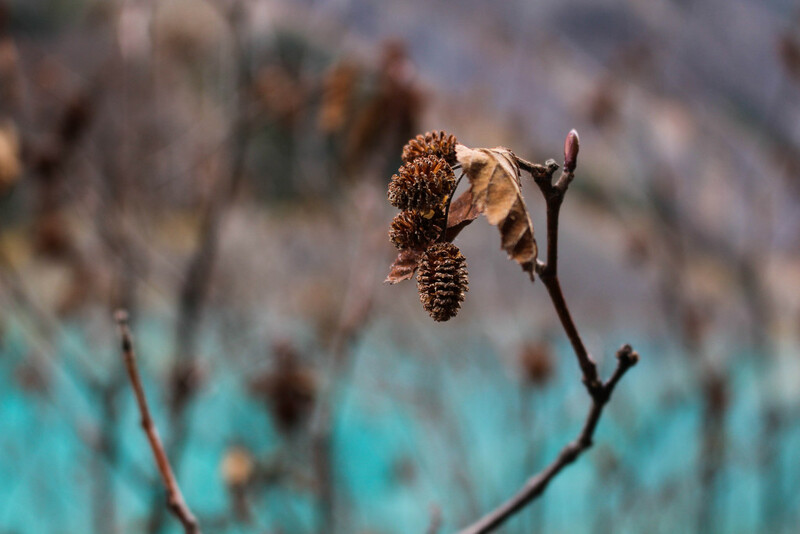 Summer or Winter you’re surrounded by beauty! As a photographer the area is a favorite and i always come away with amazing images! Plus… 2017 is free access!